This page remains for archiving purpouse. ChatRev is my oldest and most mature project. 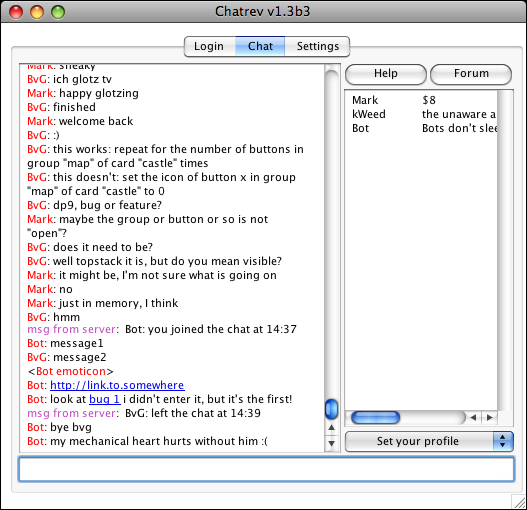 It's a client and server chat, similar to IRC, but based on my own protocol, and fully done in Rev. Im so satisfied with it, that I don't really do updates anymore. To participate, you just need to register (within the client) and then you will be connect automatically. The Scripter's Scrapbook, or ssBk is a commercial application, which uses the ChatRev server as chat facility. The server is currently running at my home, and can be reached on port 8008 at chat.chatrev.com. If you want to use the ChatRev server/client in your own project, I suggest running your own test server. Download the server stack 1.3.2. Please mail me if you want to make your own client to connect to my Server. In that case you also might want to read this text. Also, please contact me if you use my stacks, I'm always thrilled to hear when people find uses for them.